Standing there was Jerry, disheveled assistant to my sister Laura’s boyfriend, Ron, holding the largest zucchini I’ve ever seen. “This is from Ron,” he said, handing it to me. It weighed more than a ham. I thanked him and closed the door. My 7-year-old daughter regarded the squash suspiciously. Our friend Emma was coming to dinner, with her mom Leith who was visiting from New Zealand. The squash was sitting on the table in the entryway when they arrived, and I could tell they noticed it immediately. “This is for Leith,” I said, pointing to the zucchini. “Yeah,” Leslie added, “We thought you might like to take it back home to New Zealand with you.” But she was having none of it. “The Marrow” — a metaphor! I was an English lit nerd — this I got!!! It stood for zucchini at its most elemental, an expression of pure, insistent zucchininess. In preparation for our voyage to Alaska, my son and I had been reading Jack London’s “Sea Wolf”. 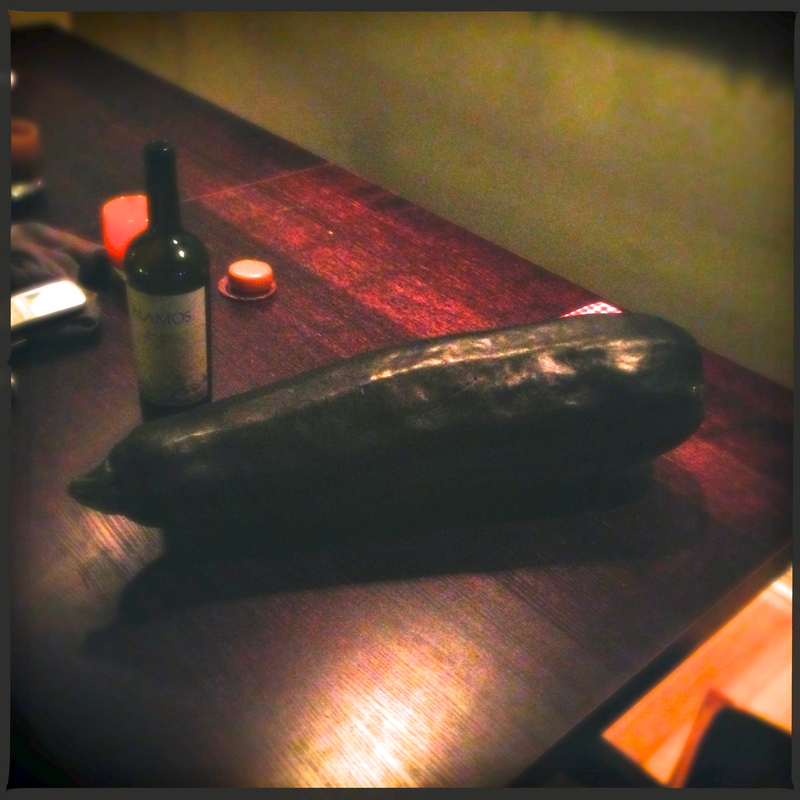 This courgette was the vegetable version of Wolf Larsen — a perfect hulking specimen. There was indeed a terrible beauty to the giant, muscular vegetable, like the bicep of some green giant. The Marrow rested beside us the entire dinner, a fifth presence, sitting there inanimate like an overstuffed guest that had fallen asleep at the table. “Yeah, or slice it thick and grill it?” Emma added. I carried it with me to the door as we said our goodbyes, giving it one more attempt to pass it off as a parting gift. They laughed, we laughed. Then they left and there I was, holding the zucchini. I stole out under the cover of night. “There’s something I’ve got to do,” was all the explanation I gave my wife. Once, years ago, someone had sent me an animated e-card. Apparently there was a national Sneak Some Zucchini Onto Your Neighbor’s Porch Day — an actual real thing! — dreamed up undoubtedly by the zucchini marketing council. And the card featured a little cartoon crook — mask, beret and striped shirt — emerging from the shadows of the bushes, leaving a big squash on a porch, and disappearing again. The Watermans next door were in for the night. As I tiptoed furtively up their front steps, I could hear them laughing inside. Perhaps they had their own company over. I knelt to carefully place the gourd, and my shoe scraped against the tiles. Jack, their Alaskan malamute, barked twice, and I made my stealthy escape. And that, my friends, was the last I heard of The Marrow. I had expected to see it back by our own front door the next morning. But perhaps Glennis decided to take on the vegetable, maybe hollowing it out and stuffing it, serving it to 20 or 30 of her closest friends. When we returned from Alaska a couple weeks back, I discovered that my mother-in-law who had been staying at the house had left behind in the fridge half a dozen reasonably large yellow crook-neck squash. At first I felt resentful. But asked to bring an appetizer to a party, I decided to turn my resentment into resourcefulness and make some kolokithokeftedes. WHU-HUH!??? you reasonably say. I introduced them at the party by a more approachable, descriptive name: Greek squash fritters. Toss together grated squash and salt, and set aside for 1 hour. Squeeze grated squash and press firmly into a colander to get rid of as much water as possible. Heat olive oil over medium heat in a large pan. Fry the fritters for about 3 – 5 minutes, until they begin to brown and crisp up. Turn over and do the same on the second side. Remove to paper towels to drain. Serve with tzaziki, if you’d like. 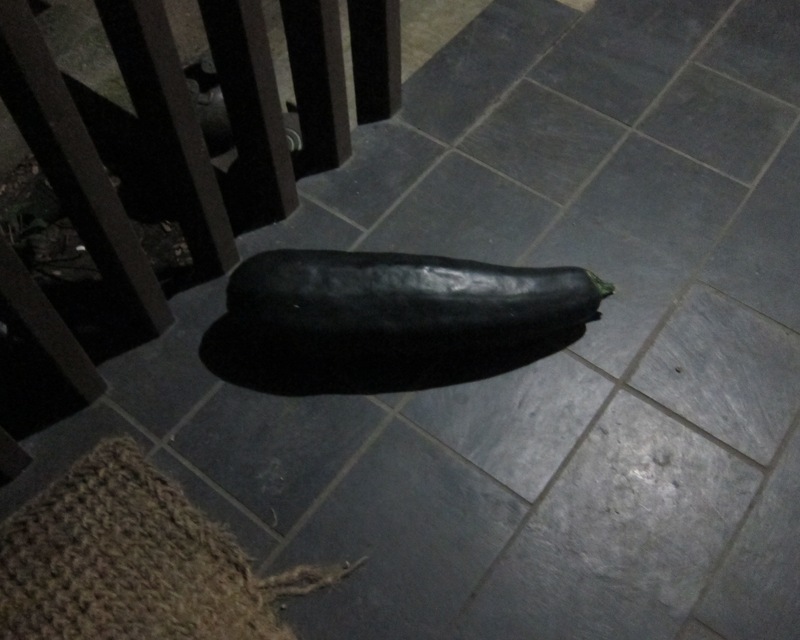 Received a spectacularly large zuke–similar to your monster– from my sister-in-law’s organic garden. It was made into bread, muffins and was stuffed with sausage then baked, and lastly sautéed with onions and tomatoes and served for sustenance for a week on baguette slices or scrambled with eggs. It was simply a terrific week celebrating late summer goodness! a tomato, red pepper soup flavored with fresh tarragon from a friends garden and finished with cream and a handful of chopped Persian cukes and avocado. Num! The joys of summer. That sounds great! I’m using up our abundant tomatoes right now, making a dish we had at a little café in the Grand Bazaar in Istanbul — eggplant, tomato, hot red peppers and TONS of olive oil cooked for hours, served with a baguette for scooping. O.M.G. – I was one of the lucky ones to sample Sean’s kolokithingies and they were AMAZING (yes I’m shouting!). Glad to have the recipe!!! You were right to give away The Marrow, though – I grew one that large once and it was woody and completely inedible. Scary but true: squash rocks! LOL, I love “kolothingies” — that’s what I’ll call them from now on. Our neighbor Glennis — recipient of the “Tag — you’re it” Marrow actually made some pretty delicious zucchini bread with it (of which we were the fortunate recipients). Glad to hear it was the gift that kept on giving – bon appetit! Enjoying your “digestible” blog posts – pun intended! Hahahahaha. This is just great! Anyone who can wrestle a 12 lb veggie to the ground is a god/dess in my book. I am in complete awe of you!